The lounge is located after security. Smart-casual is preferred, but who are we to judge. However, if we think you’re dressed unsuitably or offensively (too much skin on show, offensive slogans, themed or fancy dress, etc. ), we might not let you in. Sorry. Your lounge entry includes all food, alcoholic and soft drinks (excluding Champagne), unlimited WiFi, newspapers and magazines. You can use the lounge three hours prior to your flight time and buy extra hours while you’re in the lounge – if your flight’s delayed and you want to stay longer, for example. 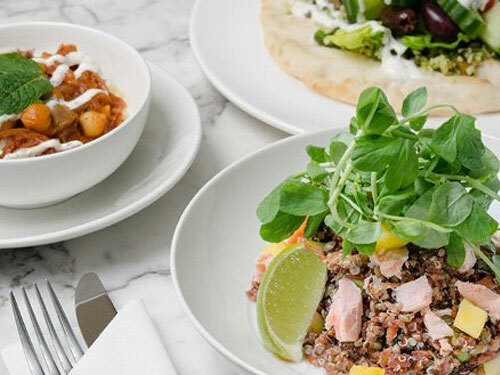 Designed exclusively for No1 Lounges, our menu includes made-to-order hot and cold dishes, plus self-service breakfast items and afternoon cakes. The food is seasonal and locally produced.